Get ready for all the Can You Ever Forgive Me? 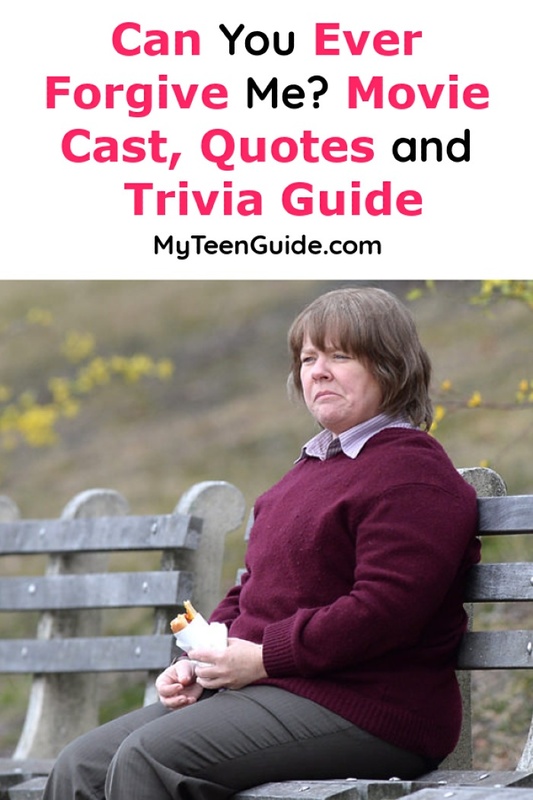 movie quotes, cast, & trivia you could ever need! Today, we’re talking all about Melissa McCarthy’s latest upcoming movie. Here’s the biggest shocker of all: it’s a drama! Well, mostly, as there are some funny parts. Still, it’s probably McCarthy’s most serious role to date, and we can’t wait to see how she pulls it off! Read on your guide to Can You Ever Forgive Me?, hitting theaters on October 19th. It is an upcoming biographical comedy-drama movie, set to hit theaters on October 19, 2018. The movie is based on the 2008 memoir by Lee Israel . Lee was a best-selling celebrity writer in the 1970’s and 1980’s. When she later finds herself broke because she can no longer get her writing published, she resorts to forging literary letters from famous writers. Cast of Can You Ever Forgive Me? McCarthy is a woman who requires no introduction (but we’ll still give her one, anyway). While the award-winning actress played other small roles in the late 1990s and early ’00s, her career really took off after she played the role of Sookie on Gilmore Girls. She has won 2 Primetime Emmy Awards- the 2011 Outstanding Lead Actress in a Comedy Series, for her role as Molly Flynn in the television series- Mike & Molly and the 2017 Outstanding Guest Actress in a Comedy Series for her portrayal of Sean Spicer on Saturday Night Live . She has also won awards for her roles as Megan Price in the 2011- Bridesmaids , as Tammy Banks in the 2014- Tammy, as Susan Cooper in the 2015- Spy and as Abby Yates in the 2016- Ghostbusters. Grant is best known for his roles as Dr. Jack Seward in the 1992- Bram Stoker’s Dracula , as Frederick Sackville-Bagg in the 2000- The Little Vampire and as Dr. Zander Rice in the 2017- Logan . The actor was born in South Africa, where his father was the last minister of education of Swaziland before the British Colony declared their independence, according to his biography. Along with playing Dr. Seward in the 1992 movie, Grant also narrated the Dracula book on tape (how people listened to audio books before Audible!). Born in London, England, Wells is best known for her roles as Mrs. Featherstone in the 2016- Pride + Prejudice + Zombies and as Vivian Prudeck in the 2017- I Do…Until I Don’t. She also played Woney in Bridget Jones’ Diary, if you’re trying to figure out where else you recognize her from. Her real name is Dorothy Perpetua Gatacre. Doesn’t really roll off the tongue, which I assume is why she uses a screen name, but I kind of like it! You don’t hear the name “Perpetua” very often! He won the Best Performance by a Featured Actor in a Play and for Best Performance by a Leading Actor in a Play, both for his role as Prior Walter in the play- Angels in America. He is best known for his role as Russell in Royal Pains. Can You Ever Forgive Me? has some really great quotes! I’m not surprised, though, Melissa always has fabulous lines. Check out the trailer, then read on for our favorites! Employee- “Oh, we have copies of your latest work right over there.” As he points to her latest book that’s displayed on the 75% off table. (Would you tolerate a rude attitude from a bookstore employee, or any employee? I know I sure wouldn’t)! Jack- “Craigy, top her up.” Talking to the bartender. Lee- “Oh.” With a look of disappointment. Paul- “Miss Israel, I have a couple of questions regarding the last letter I purchased.” Message left on Lee’s answering machine. Lee- “What seems to be the problem?” Visiting Paul in person. Lee Israel forged more than 400 letters, all from famous writers who were deceased. She served 6 months of house arrest and 5 years of federal probation, after pleading guilty to “conspiracy to transport stolen property” in June 1993. In April 2015, Julianne Moore was cast in the role of Lee Israel. She exited the role several months later because of creative differences. I don’t want to take away anything from Melissa McCarthy as an actress, because she is highly talented, but I think I would have liked to see Moore play the role instead. Maybe because I associate McCarthy with comedic roles. What do you think? Maybe this movie will be the one that changes my mind! Marielle Heller is the director for Can You Ever Forgive Me? Previously, she directed the 2015- The Diary of a Teenage Girl , which was her movie directorial debut. It’s not even out yet and the ratings are phenomenal! The movie has already received positive reviews from the top two aggregator websites. On Metacritic, it has received universal acclaim due to its average score of 87 out of 100. On Rotten Tomatoes, the movie received an average score of 8.3 out of 10. (Can you believe this movie is doing so well already and it hasn’t even hit movie theaters yet)! McCarthy & Curtin, together again! This is the 2nd movie Melissa McCarthy and Jane Curtin have starred in together. In the 2013- The Heat, McCarthy played the role of Detective Shannon Mullins, while Curtin played the role of her mother, Mrs. Mullins. I don’t know about you, but I’m really intrigued by the whole idea of McCarthy in such a relatively serious role. I mean, it definitely sounds like it still has its funny moments, but for all intents and purposes, it’s a drama. I want to see it just to watch her in action! Have you heard any other great Can You Ever Forgive Me? movie quotes or trivia? Share below!